Beautiful Gulf views from your 6th floor screened-in, balcony. Sunsets every night over the sparkling waters and barrier islands! 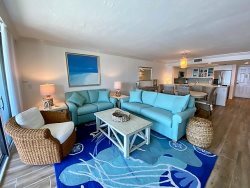 Our vacation rentals near Sanibel Island are well-appointed with a delightful palate of neutral. Equipped with newer appliances, furniture, and crown molding throughout. There is a HD TV with a DVD Player in the living room and both bedrooms. Enjoy a meal on your furnished balcony while watching for dolphins in the water below! King bed in the master and two twins in the guest bedroom. Walk-in closet and separate soaking tub in the master bath. Sleeper sofa in the living room. Sleeps 6 people. You may have found this rental on HomeAway 4363821, HA ID 4363821, VRBO 4363821ha or Vacation Rentals 4363821.